Upper left and right: My iMac, the short-lived "Flower Power" edition (2001). 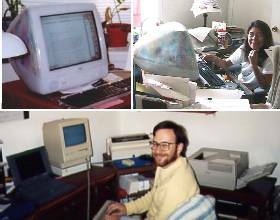 Bottom photo, from left to right: PowerBook 150 (1994), Mac Plus (1987), ImageWriter II (1987), GCC Personal Laser Printer (1989). Eleven years after this photo was taken (January 1995), all three of the Apple products pictured here still function! Remember that old song by Queen, "I'm In Love With My Car"? Well it's kinda like that. In the early 1980s I used to press my nose against the window of computer stores and yearn for an Apple IIC or an Apple III. Then came January 1984 and the unveiling of Macintosh during the Super Bowl half time. I could see right then and there my destiny as a crusader for free thought. Three years later I finally had enough money to buy my first Mac, a Macintosh Plus, and I was immediately enthralled with the vast power at my disposal. In 1994 I bought an Apple PowerBook 150 and took it to Peru with me to do writing and research for my dissertation. In March 2001 I bought my third and current Mac: an iMac "Flower Power" edition, and once again I was in MacNerd heaven. All three of my Macs still function, and I have no plans to dispose of any of them. I don't expect long-term Windows users to understand, but I know there are plenty of Mac folks out there who know the joy: Macs rock!